This Birch Family Services professional development training session offered both ASHA CEUs for Speech Therapists and CTLEs for Teachers, Teacher Assistants, and Educational Leaders. Last week, Birch Family Services Education and Related Services staff took a professional development day to attend a training session on bridging research and clinical practice. The session, “Quality Instructional Language and Communication for Optimal Learning for Preschoolers with Special Needs,” was presented by Dr. Catherine Crowley, Professor of Practice and Program Director at Teachers College, Columbia University where she’s also Coordinator of the bilingual/multicultural program focus and Director of the Bilingual SLP Extension Institute. Dr. Crowley, whose work focuses on providing culturally and linguistically appropriate disability evaluations and in developing bilingual programs that support the academic and linguistic development of children and adolescents, engaged Birch education staff in a variety of activities to carry-over to instruction in our schools, including expanding staff understanding of bilingual development and how to help our preschoolers develop their home language as well as English. For example, children need many opportunities to use English in school as this influences literacy development. “This was the most interesting and engaging training I’ve been to in a long time,” said Ilana Talitian, a speech therapist at East Flatbush Early Childhood Center. Among other things, Dr. Crowley stressed the need for children to understand the main idea in stories, to make inferences and predictions, and to problem solve. She emphasized the need for all staff to focus on the theme of the month and expand language and concepts of the monthly theme (i.e., water, etc.). That is, Teachers, Teacher Assistants, Speech/Occupational/Physical Therapy Providers should focus on developing and expanding language specific to the theme. Instruction should be differentiated according to the child’s abilities. 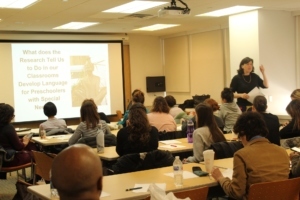 The event offered both ASHA CEUs for Speech Therapists and CTLEs for Teachers, Teacher Assistants, and Educational Leaders. Birch Family Services is committed to sharing our expertise to benefit the professional development of our staff so we can better support those we serve. Our staff works with schools, agencies, service providers, parents, and individuals — all those who live with or work with children and adults with autism and developmental disabilities. Our professional team of trainers and consultants offer a wide range of professional development opportunities for our staff, families and other professionals across various disciplines not limited to but including, Early Childhood Education, Social Work, Psychology, Speech/Language, Educational Technology, Occupational Therapy, and Administration.